The way to test it is on a Rolling Road, one run with and one without. You should see an increase in boost pressure and power without. My car made another 80BHP without the canister and only lost 5BHP with a very large K&N Cone filter. Is there no way you can package the intercooler in front of the Radiator? Your inlet temps must get pretty high when you are running hard. Just getting my head around this. So you have a Rotrex Supercharger which makes 16PSI with the pulley you have on it and you've installed a wastegate to control the level of boost? So the supercharger is still trying to make the boost but you are bleeding it off? Would it not have been easier to change the pulley and underspeed the supercharger to give the desired results or put rods/pistons in to take the 16-20PSI the supercharger is capable of? Looking at the picture you probable need to get a bigger exhaust for the power you are making. the wastegate limits the boost to 10psi as the motor has stock internals. The smaller pulley allows the boost to build much lower down the rev range.... it is a common trick with a supercharger. Space is at a premium at the front.... the highest inlet temp I have seen so far is 50*c, in the slow part of the track. Will try the test with the aircleaner next time it's on the dyno. Evan, I think you are maybe confusing the way a 'normal' supercharger works and how a Rotrex works. Pulley size will dictate how fast the supercharger spins, the faster it spins the more boost it makes (until it overspeeds and falls out of its operating range). On a C30-94 the peak rpm is 100K at which point (all other things being equal) it should make 1.3-1.4 bar or thereabouts. You can step the speed of the charger down by having a bigger supercharger pulley so it only runs at 80K and 1bar (as an example). The speed reduction and boost reduction happens across the operating range of the charger. Will set up the manometer and check the pressures across the filter. Have you also done this for you intercooler? there was a good article here http://www.autospeed.com/cms/article.html?&A=113178 about the guy looking at air flow out of the engine bay. A few tweaks could see a big change in flow. It be interesting to see. 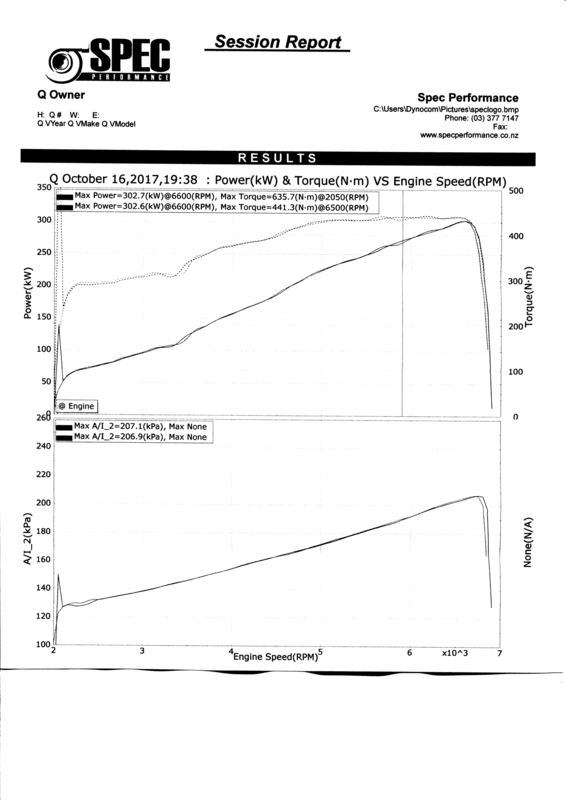 jeffw wrote: ...Pulley size will dictate how fast the supercharger spins, the faster it spins the more boost it makes... ...You can step the speed of the charger down by having a bigger supercharger pulley so it only runs at 80K and 1bar (as an example). The speed reduction and boost reduction happens across the operating range of the charger. But then he'd only have 1bar at higher engine revs. With the smaller pulleyand waste gate, he gets the 1bar low in the engine rev range and then holds at that right across the range. But low down is where the damage to the engine/transmission happens, why not let it rev out correctly with the right boost? Never mind, each to their own. I've got shocks to put back together for the first events of the year this weekend. The point is that the engine is safe with stock internals at 10psi throughout the rev range. I can't get 10 psi at 4000 rpm with the larger pulley. The engine is not safe at 16psi at any speed, it is knock limited, so the only way to achieve what I want is the wastegate. It also gives me the option to easily tune for E85 ethanol without the need to change pulleys... just use the dual map feature of the ecu. I know it is not ideal to be venting boost, and once I blow it it and need to rebuild it, I'll fit the rods and pistons to suit. Just built a new exhaust system and upped the boost.. after a long time on the dyno....406 rear wheel hp. Serious torque curve makes it a delight to drive.. idles round town like a stock Honda accord, pulls like a schoolboy.